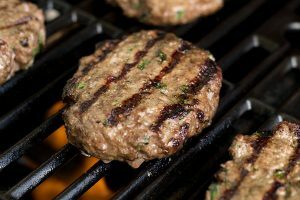 In a large mixing bowl, combine ground beef, room temperature Garlic Butter, Worcestershire sauce, parsley, salt, and pepper. Mix completely. Form meat mixture into 6 patties, making an indent in the middle of each. Cook on the grill over medium heat, about 4-5 minutes each side, or until the inside is cooked. For the buns, brush Garlic Butter on the buns and grill for 1-2 minutes, flat side down. Assemble burgers and buns with your preferred toppings and condiments.